No smudge-proof, waterproof, water-resistant, claim has stood up to my oily lids. They cause every shadow, liner, and mascara to pool under my eyes so that I look like a zombie within an hour. This product has changed all of that when it comes to mascara! I can now use every single tube that has been collecting dust because I didn’t have the heart to throw them (and my money) down the drain. Not only does it waterproof my lashes, the spoolie also separates and de-clumps. 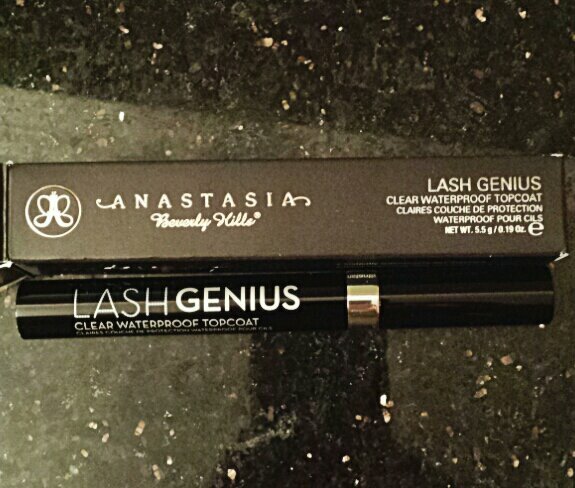 Thank you, Anastasia, I can now wear ANY mascara with confidence! Final answer: OMG! It’s amazing–a modern day miracle (for me). Have you tried this product? If so, let me know what you think about it. Thanks to a massive Sephora haul, I will be doing a lot of reviews in the near future. I’m a skin junkie; flawlessly done foundation and concealer are my joys. When it comes to makeup, I focus on skin, lashes and lips. Although I love eye looks, I have yet to find products that stay put on my lids; these greasy eyelids of mine have vanquished every waterproof, smudge-proof, budge-proof, longwear claim on the market (and yes, I’ve tried a slew of primers as well). I will never give up my quest, however, because I long to wear a winged eyeliner look that doesn’t turn me into a sad panda within one hour. Until that blessed day comes, I will keep trying to perfect my “skin, lips and lashes” looks. Never fear, readers; you will see all of my hits–and major misses–documented here for your entertainment.